2017 Montgomery Gentry Underground Party On Sale 3/10 10 AM CST! 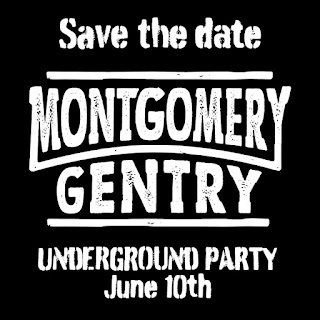 This year's Montgomery Gentry Underground Party will be on Saturday, June 10th at 12:30 pm. Tickets will be available on Friday, March 10th at 10:00AM CT. This year’s party will be held at 3rd & Lindsley. The event includes lunch, a full band performance, door prizes, surprise souvenir, and meet and greet. When: Saturday, June 10, 2017 at 12:30 p.m.
Tickets: On sale Friday March 10, 2017 at 10 AM CST here! Join the Underground (Montgomery Gentry Fan Club) for as little as $15! Click here to join!